You’ve all been amazingly patient, understanding and supportive as we’ve worked through our list of tasks and solved our problems, but we are entirely delighted to announce that Empires of the Undergrowth will be entering early access on December 1st, 2017! Early access brings an entire overhaul of the game – the biggest of which is Formicarium Mode, where you build an ant colony in a lab and upgrade it by playing missions out in the wild as different species of ant! There are four entirely new missions, two special challenges for your Formicarium, and you can explore the bountiful yet dangerous outworld above your nest. This means the game will be for sale on Steam, and those of you who already have a copy (by backing the game or through itch.io) will be able to download it through Steam on this date! It’s been a tough few weeks for our dev team. We’ve taken feedback from beta testers, worked through a huge number of game-breaking glitches, balanced, tweaked and tinkered. Obviously that won’t stop – when early access is underway we’ll still be listening to suggestions and responding to balance issues, whilst we begin work on the first new content for early access. So you’ll all be building your formicariums and battling the critters of the undergrowth in two weeks. In the meantime, enjoy the epic announcement trailer! This is the first in a series of monthly roundup newsletters that will point you to the location of news and interesting things about Empires of the Undergrowth and its development. March has been an extremely busy month in the run up to EGX Rezzed. Over the course of the month the first surface biome (the beach) has come together along with enemy colonies. It is still very rough around the edges but we took it to EGX Rezzed and received some extremely positive feedback and plenty of suggestions. There is a video on the way showing our experience at EGX Rezzed so keep an eye out for that. What follows are links and short descriptions of interesting things that we have shown this month (also those from last month as we are catching up). A New Year in the Undergrowth! I hope you all had a splendid break and the return to work has not been too bad. Our year has started with a mix of code optimisation, improvements to combat systems and planning the year ahead. With that in mind Empires of the Undergrowth will be at EGX Rezzed in London on March 30th to April 1st. We will be showcasing surface gameplay features as well as a range of new creatures. Additionally we will be testing out multiple ant species at this event too, so if you happen to be in the area, come and see us! More about this later in the year. So what do we mean about optimisation? Well put simply we want you to be able to build more ants! There will of course be a limit on the amount you may build, but we want that limit to be as high as possible, so you really feel like you have a thriving colony. This has meant Matt has had a proper poke around in Unreal Engine’s movement systems and is implementing our own movement routines, these are specific to our ants’ needs and should help us pump out those extra frames per second. One of our goals has always to be to show the variety of things that different ant species can do. Ant games in the past tended to have a generic ant, maybe branching into sub-types of worker, soldier, super soldier etc, but we wanted to do something different and try to show off some of the true range in nature. John has been putting together a creature ability system that allows us to produce a lot of different types of ant and other creatures efficiently. We do not want to write completely new code each time we want a creature to jump for example and so there has to be a way to make variety quickly, and balance it so it still works in the game. 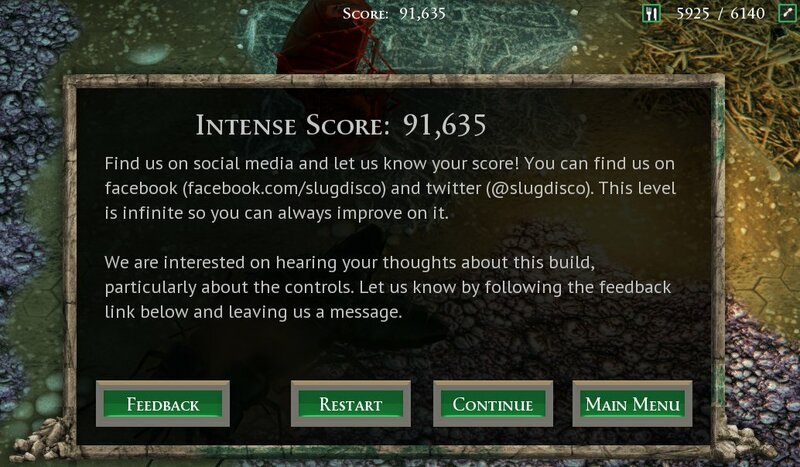 Music is an important piece of any computer game, especially in Empires of the Undergrowth where the tempo helps to set the pace of play. Liam is currently working on a dynamic audio system that should adapt the musical atmosphere to match the action on the screen. We are in unfamiliar territory with this one, and we really don’t know what the end result will be, but the basic tunes are already coming together nicely. 2017 is going to be an exciting time for Empires of the Undergrowth, Make sure you have followed us on Twitter and Liked us on Facebook to see the game coming together. What are these? Controls for ants? Empires of the Undergrowth has gone through many iterations in many areas since the beginning. We began building the Unreal Engine version of the game in January this year so soon it will have been in production for a whole year, however the first builds of the game were in our own engine long ago, and the game played very differently then. The idea started as Dungeon Keeper but with ants for mobile. We went about setting up a game where you would fight subterranean wars with other colonies, tunnelling out food and growing. One of the core gameplay concepts was always to have the player focus on the bigger picture rather than individuals, after all, an ant colony is not about the individual ants themselves. The question arose: how do you control something that is by its very nature autonomous and numerous?.. managing that would be a nightmare to master. We did not want the player to have direct control as this would defy the point of the game, the creatures should really have their own minds. We decided to automate everything they did, if an enemy appeared they would attack it, if you tunnelled into the enemy colony, your soldiers would head right for it. Fancying the challenge, we built our own engine… Fast forward a year and a half our buggy engine is running an early build of the game but it was missing something. This subterranean warfare didn’t feel right, it wasn’t doing ants justice. The simple fact is ants don’t stay underground, they forage on the surface. Our ambition getting the best of us, we decided that is what we needed. Not a single underground, but one for each colony. Under this system our automated attacking would play out like a Tug of War. Workers would constantly bring eggs to soldier tiles and new and new ants would be born. These ants would clash with the opponent on the surface in epic battles growing in size; the player needed to mix up their colony composition to gain an advantage, pushing the opponent back and killing their queen. In principal this was a tried and tested game mechanic borrowing heavily from a custom map in Starcraft 2 – Desert Strike. This was manageable as well and we could bend it to fit into a campaign idea that had emerged by this point that we had fell in love with. It was with this concept we launched our first Kickstarter which didn’t completely fall flat, but it did fall short. We were not looking for a huge amount of money, and by the end we had been seen by a lot of people, but the backing was not coming through. Something was wrong. Do people really want a mobile version? Ask someone who likes our game concept if they want a mobile version as well a PC and they will say yes. Ask them which one they would prefer and the answer seem to heavily favour the PC version. We used the data from the kickstarter the make a judgment on this. Looking at the backers for mobile only and PC only, it is 20 on mobile and 149 on PC. Not huge numbers but it does give you an idea. So we cut the mobile version, and with it our own engine. We had stuck with our own engine to this point for performance reasons, in order to have so many ants running well on mobile technology, but with that requirement gone we were just making life difficult for ourselves. And with all this changing, do we really need the controls to be so simplistic? With a mouse we can now give players more control. You could argue that this is feature creep, but until the features match what player will pay for you probably need to add more. The pheromone marker made its first appearance in the demo we released with our second Kickstarter: A point that soldiers would be attracted to, instantly giving players a level of control but not so much that it destroyed the original bigger picture concept. Players seemed to get on well with this too. This was the first public demo build we had released and streamers had started picking it up. The system was intuitive, responsive and still felt like the ants were in control of themselves. Underground this works very well. So you haven’t played the surface have you? We made a test build for the surface just before EGX and we took it along to see what people thought (some will have played it but not many). The controls worked, but it was not right. With such a wide open space and with groups of ants hovering around a single point it felt a bit strange. Almost too much like a standard strategy game and less autonomous. What was great in the tight corridors of the nest was falling a bit flat above ground. In nature ants will wander to and from the nest, feeding other ants on their way if they find a food source thus reinforcing a route that leads to food. Our game being more fast paced than a simulation we wanted a way to replicate this but in a short space of time. The first iteration of trails is what you see in the 0.0561 build you can download. Ants will head to a point, wander around the point for a few seconds and then head back to the nest. The amount of ants heading to the point is based on the number you have assigned to it and the distance from the colony. It essentially tries to balance the number of ants ant each point of the trail. We built in a mechanism to prevent the player having control where, if you place a new point down, ants must return to the nest before heading to the new point. In principle this should mean when you place a new point, the flow of ants coming from the nest go to the new point so it is still fairly responsive but what we found was when players had few ants (less than about 50) the system felt frustrating. Quite a few liked the system, but quite a few others did not, and we can very much see why. As a developer I have been playing the game constantly as I change things, training myself to think in the new systems and understanding them intrinsically. The updated systems were not intuitive and some people flat out thought they were broken. We did a further iteration of the system. We wanted it to feel more responsive but we are trying to avoid something quite specific. Imagine you have a trail of ants going back and forth and you change the end point they are heading to, the whole trail changes direction at once. This looks and feels bad and is not at all like ants. Perhaps the most divisive thing we added in the recent demo was the introduction of trails. This means ants will head to your marker, and then head home from there. If they start heading to a marker they will reach it then return before going elsewhere even if you move the marker. Part of our design philosophy has been to have the player control the big picture and be less concerned with individual movement. The controls were designed to promote this colony building focus, and be less about high speed plays. Whilst we feel trails do help achieve this they are admittedly a little unresponsive which can be frustrating (especially if an enemy moves) whilst your colony is still small. On top of this the way they work is not particularly intuitive which has lead to some people believing it to be buggy. This is a work in progress and it might take a couple more iterations until everyone is happy with the control system. We have been toying with a alternative few concepts which keep the basic idea of ants forming trails, but with more obvious reactions from the ants when you give them new destinations. Currently the only level with difficulty settings is the new Surrounded level. These settings change the amount, type and aggressiveness of creatures that attack you however they do not make the creatures weaker or stronger; creature stats remain the same but you get attacked by more of them. A problem has arisen with this approach. Enemies turn into food when they die which is great, however it causes a situation where the more enemies we are sending at the player, the more resources they receive. This escalates to the point where harder modes can actually be easier. The amount of food available is a delicate stat to play with. On one hand it is nice to give a reward for defeating a big creature, on the other hand once you get past a certain point defeating a big creature becomes easy and your colony grows exponentially; your massive food stores are full and you can go to bed and let your colony deal with itself. This reduced risk takes the joy out of the reward. It is something we will continue to monitor carefully but for now there are a couple of things that will lessen the problem. Firstly a drop in the food reward will bring things more into balance. Additionally the game can get harder by increasing the frequency of pack spawns, and also the sizes of the larger packs to increase the risk of the kill (currently only 1 Tiger beetle will ever spawn at a time). The level currently peaks difficulty at 30 mins, we can change that also. The larger creatures of the game or the Titans (we haven’t added any yet) will always be fought individually and so harder game modes will require their stats altering.